I am in (and actually now one of the moderators of) a Facebook group that studies picture books by debut picture book authors who are not also illustrators. What better way to help us figure out what they are looking for out there? It's a great group (ask to join if it sounds like something that might interest you!) and we just finished a book study and interview with the author. And, in the process, I fell in love with January's book. So here it is, as my latest contribution to the lovely Susanna Leonard Hill's Perfect Picture Book Friday. First Spread: Prudence wants a pet. 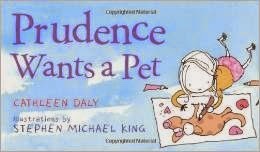 Synopsis (from inside book jacket): Prudence wants a pet. Desperately. But Prudence is determined. She finds her own pet. It is a…branch. But Branch isn't exactly the pet of her dreams, and neither are Twig, Mr. Round (a car tire), or her baby brother Milo. Poor Prudence. Will she ever find the perfect pet? Resources: Have the kids talk about pets they have, or that they want to have. Make a graph for a visual representation. When have they wanted something very badly? What was it? Did they get it? Why I LOVE it: The dry humor. The fabulous blending/balance of words and illustrations. Prudence's creativity and imagination. The voice. The story arc. The PERFECT ending. The depth (which you don't necessarily see unless you study it for a week like we did - but it was SO worth it!). I LOVE PRUDENCE. This was me as a child, so I relate--as will other kids. I love that she makes a pet out of a branch. Sounds like a very imaginative book! Nice choice. And YOUR insights, Jilanne, are part of what made it a favorite for me. Thanks for contributing - AND for stopping by! Well, I know all about kids who want pets. And parents who don't. And I like a good tale with creative kids! This one looks excellent! Thanks! Hope you enjoy it - thanks for stopping by! My son loved this book! We haven't read it in ages. I think I'll have to fix that. Thank you for the review! You are very welcome - hope your son enjoy it just as much this time around. And thanks for stopping by!